Genres: Children’s fiction, dystopia, science fiction. In a world with no poverty, no crime, no sickness and no unemployment, and where every family is happy, 12-year-old Jonas is chosen to be the community’s Receiver of Memories. Under the tutelage of the Elders and an old man known as the Giver, he discovers the disturbing truth about his utopian world and struggles against the weight of its hypocrisy. With echoes of Brave New World, in this 1994 Newbery Medal winner, Lowry examines the idea that people might freely choose to give up their humanity in order to create a more stable society. I always (well, since I found out about it about six months ago) see this book being mentioned as the original, and the young-adult dystopian book that you should read. It has so much popularity but almost seems underrated at the same time. It’s not promoted in bookstores, online, or anywhere really but my followers on Tumblr really wanted me to read it. It got 78 votes in my “What shall I read next?” poll. It’s set reading in American high schools (and younger!) and is high on lists of dystopian novels and young-adult books. Despite the fact that I am not its target demographic, I really enjoyed it. In this book, choice is very limited. Every aspect of life is controlled and decided by the community. Rules must be adhered to and individuality is negatively received. In some ways, it is very conservative but this ideology goes to another level – older residents and those who do not have children (or children that have moved away) are practically separated from society. There is no pain, or hurt, for members of the community but this comes at a price, as you find out in the book. I particularly found the message that control of language is a very powerful thing very enlightening. Even though it’s something I became familiar with during my degree (Sociology), when I usually thing of control, I think of how people are usually physical constrained and prevented from doing something (or forced to do something) and it’s easy to forget that control of language, knowledge and ideas is much, much more damaging (something I’m also coming across in The Handmaid’s Tale). I can now also understand why some people didn’t like books such as Matched and Delirium as much as I did. 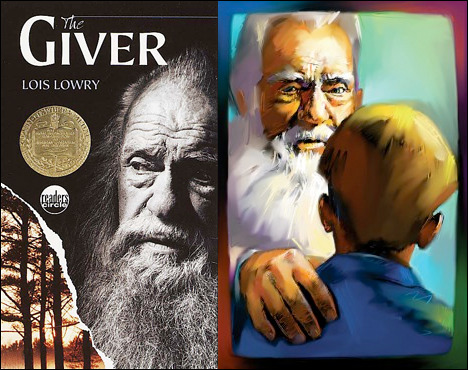 For me, it was a fascinating new genre, but in The Giver, the government controls who a person is “matched” with and controls the amount of children they have. This may sound like repetition of every other YA dystopian book but this book was written in 1993 and so presented these ideas well before the success of The Hunger Games. I now understand why it won so many awards because in its time (I’m making it sounds SO old even though it was written in my lifetime, eek) it must have been terrifying and exciting to children and young people whereas now it seems like dystopian books are everywhere. It’s a very short read but still manages to be powerful, realistically imaginative and emotional. It ends on an annoying cliffhanger and so I understand how people (who didn’t know there were other books in the series) thought it had a bad ending… but it just makes me want to find out even more. edit: Okay, I see now that it wasn’t exactly a cliffhanger. I had assumed the series would continue directly from the first book but apparently the ambigious ending was deliberate – an attempt to get children thinking more about what could happen. The control of languages just reminds me of Newspeek in 1984, which is even more terrifying IMO.